Irises "Live at the Forum"
There is a new kid on the block in the Iris forum segment on the internet. Founded by Polly Kinsman of Siberian Iris Gardens and Dee Stewart of Snowpeak Iris. "It's in the beginning stages, but what we are attempting to create is a forum where iris lovers can go to chat, and learn, similar to Dave's Garden, but with no charge for membership. It is on the new website Cubits, and is simply named 'Irises', Polly says. "We currently have over 100 members and are growing every day, and it is our hopes to have not only forums to discuss irises, but articles about irises, and some informational pages. So, please, if you get a chance, stop by and see what it's all about. We welcome iris lovers regardless of expertise, and all visitors will find it a very friendly site. Hope to see you soon. "she added. Readers can visit the web site via http://cubits.org/irisforum/ or click the above photo. Tall Bearded Historic Iris "GAY LIGHTS"
Gay Lights is an Iris that is reported to be uncommon in the Country of its registration (USA) yet this outstanding reverse bi tone, which is an unusual color tone is still available from three small commercial Iris growers in New Zealand who generally seem to be the home for back catalogue Irises (Long may they exist). This iris grows well in our garden, strong growth with good increase, blooming in a bed amongst the older browns like 'Inca Chief' and 'Frontier Marshall'. Can't say I liked it at first but growing with the browns and reds it certainly stands out. It was because the Jean Stevens introduction 'Watchfire' is in its parentage that originally kindled my interest in this variety. GAY LIGHTS (Schreiner, 1965). M 34"
GAY LIGHTS (Schreiner's, R. 1964). Sdlg. R-955-A. TB 35" ML. Y5. S blended copper-bronze; F lighter, rich molten-yellow without orange. ((Watchfire x Argus Pheasant) x Inca Chief) X Spellbound., Schreiner's 1965. HM 1966. Clicking the above image will take you to the larger, higher resolution version. Tall Bearded Iris "LOCAL COLOR"
Fantastic increase and always gives that little bit extra by been a consistent bloomer over a long period.' Local Color', has as its pollen parent the mysterious and aptly named 'Gallant Rogue' bred by Barry Blyth yet named by Keith Keppel. 'Witches Sabbath' Bill Maryott's heavily ruffled purple black is the pod parent. 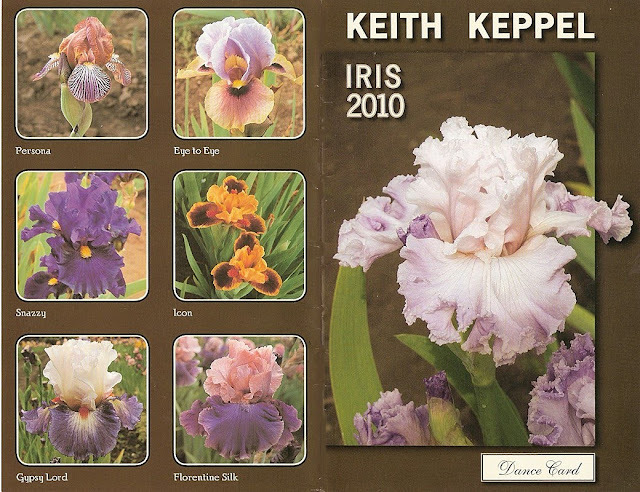 With the same parents Keith also produce another stand out later blooming iris "Night Game". LOCAL COLOR (Keppel 1996)M. 40"
Arilbred Median 'Green Delight', a New Zealand historic iris. The registered description of 'Green self ' is somewhat simplistic and lacking in detail. 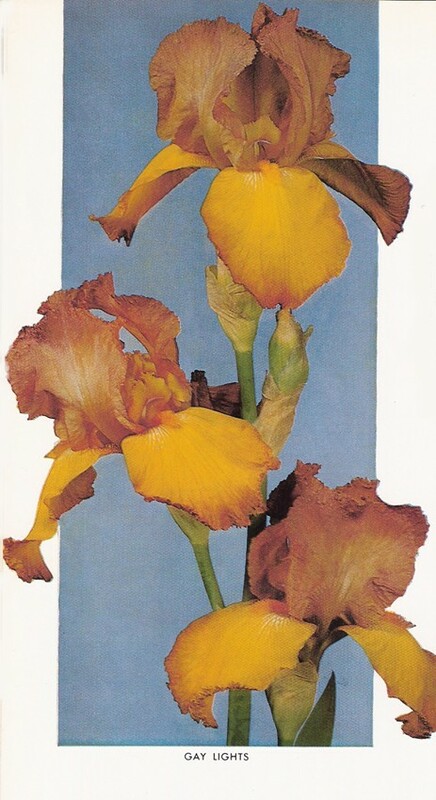 In the Maerz and Paul Dictionary of Color, Citronelle across all the range (98, 99,101,102) is a better colour match for this iris.White beard tipped Spanish yellow. An easy Iris to grow with no problems apart from slow increase. Blooms with the intermediate irises mid-season. If you have got a moment to spare Check out The Aril Society International web site. Tall Bearded Iris "ABOUT LAST NIGHT"
A cross of two 1980 irises, Bill Maryott's 'Witches' Sabbath' and Paul Blacks 'Oklahoma Crude' both purple blacks Irises with mustard beards, gave Paul Black a Deep Black Iris with yellow beards and a glowing red heart. A very attractive fragrant iris with the ability to rebloom an unusual trait in black irises so if you only have room for one Black Iris in your garden why settle for a solo performance when 'About Last Night' could give you an encore in Autumn.I have not tried it yet but it is reported to be fertile. I grow a clump of three plants and the above photo shows Jean Steven's 'Watchfire' in the background so it grows with some classy company. Tall Bearded Historic Iris "MARY RANDALL"
Growing at home this heirloom iris is a real visual treat and is a true pioneer in the colour tone Rose Pink. Clean and strong foliage and clumps up well. Mid season bloom.Considered to be one of the aristocrats of tall bearded hybridisation. Fertile both ways. Fays Gardens, Wilmette, Illinois. Iris and Hemerocallis 1952. This deep rose pink self, with a bright tangerine red beard, is a new color in Iris- "Bengal Rose" in the R. H. S. Color Charts. The flowers are large and have a thickness of petal seen in few Iris. The haft is very wide; free from markings. Falls are round and flaring with a rippled edge. Standards are well formed and hold together firmly. The form of this flower is near perfection.Flowers are well spaced on a strong nicely branched 36- inch stalk. Plants are large and vigorous, with good foliage. The pollen is fertile, and seeds are produced in abundance. Mid-season . H.C.1950. H.M.1951. Irises, Harry Randall, Chapter 9, Famous Tall bearded Parents. This Bengal-Rose Iris, raised by Orville Fay of Illinois, first flowered in 1948; and the fact that it was named after my daughter has done little to rescue me from complete obscurity. My wife and I live in a kind of reflected glory! Apart from its attractive colour, which was at first new to the bearded family, it had good substance and breath of petal, and completely free of the virus which had previously affected so many pink or pinkish irises. Expert Iris growers are always quick to experiment with new cultivars of exceptional colouring to test their value as parents, and it soon became obvious that Mary Randall was something out of the ordinary. Hybridizers made extensive use of it, and nurseries at first had difficulty in meeting the demand for it. In my family circle the two brothers of the real May Randall were thus able to quote catalogues which proved, so they said, that their sister had tough substance, was broad in the haft, had a red beard and was good for breeding! The international body for the registration of Iris names is the American Iris Society, which issues annual lists of all new Iris registrations. 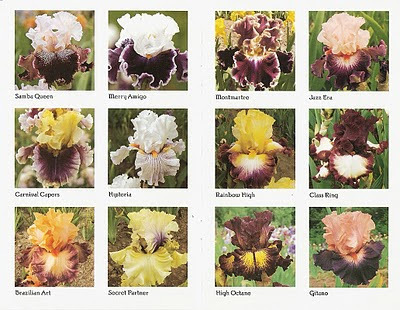 Those lists show the extent to which Mary Randall has been used and has widened the range of iris colours and shades. Brother Charles Reckamp crossed it with the yellow Techny Chimes and produced one of the earliest 'orange' irises, Celestial Glory which, in its turn, produced Mission Sunset in the same colour range. Orville Fay himself raised hundreds of excellent seedlings from it, including Fleeta, which has also been a great parent; and in subsequent generations he has raised the deep pinks Flaming Heart and Flaming Dragon. By using it with other parents he has raised Rippling Waters, winner of the Dykes Medal 1966, Morning Breeze, Spring and other attractive irises with Orchid blue colouring, and these, in my opinion, have great garden value. In the hands of hybridisers elsewhere Mary Randall, either as the seed or pollen parent, has helped to produce Pretty Carol (rose-orchid) Firenze (Violet with red beard), Golden Masterpeice, Imperial Amethyst, Melbreak (rose-opal), Idaho Cream, and many others of equal merit. Before leaving this iris I would mention that Orville Fay kindly sent a root to me in the early days and generously allowed my friends and me to use the plant and the pollen for hybridising. Seedlings resulted, different from any previously raised in Britain, and the growers had a satisfaction which was not entirely unjustified. Bulletin of the American Iris Society, October 1951, Number 123.Varietal Comment, Region 6, Don Waters, Ohio. The pinks are becoming more bewildering and yet more beautiful as they progress, however the intensity of color. differs little in those which I have seen. Mary Randall is a very beautiful iris and very pink with a rosy shading throughout-a fine iris indeed. Bulletin of the American Iris Society, January 1952, Number 124. Random Comments Harry J Randall, C.B.E. Mary RandalL I ought not to comment on this, perhaps, but as I did not raise it I might be forgiven for describing it as a splendid break in colour and one of the best of all irises. Its pollen is amazingly fertile. Bulletin of the American Iris Society, October 1952, Number 127.Varietal Comments from Region 13, Mrs Joseph Hunt, Tacoma, Washington. Mary Randall-nominated as the iris of the year by a lot of iris fans, has everything; clean, heavily textured, broad, wonderful form and stands up in all kinds of weather; very long lasting blooms. Really superb. The Iris Yearbook (BIS), 1953,"Report from America in 1953", page 76, Catherine Hemingway Smith.MARY RANDALL (Fay) Award of Merit 1953, the iris to receive the largest number of votes for A.M. this year.Large, full, shapely blooms; classed as pink, the general colour is ashes of roses, highlighted by the luxuriant tangerine beard. The Iris Yearbook (BIS), 1956,"A Decade of Progress", page 146, H.F.R.Miller. We are now seeing some superb irises of other pink tones. MARY RANDALL (Fay 1951), the Dykes medal winner in America in 1954, is a deep rose-pink and is a lovely flower. This deep rose-pink self with bright tangerine-red beard is a new color in iris. The flowers are large and have a thickness of petal seen in few other varieties. Haft is very wide, free from markings. The form of this iris is near perfection and the flowers are well spaced along a nicely branched 36-inch stem. Produces wonderful seedlings. Dykes Medal 1954. Region 14 Northern California, Nevada,Regional Bulletin, Fall 1957. Iris New and Old, Hazel Stewart, San Jose, California. MARY RANDALL Fay 1951 is a most satisfying iris. I consider it a must. It blooms over a long period. The deep rose, a much needed color, stands out and the blossoms last a long time. Schreiner's, Salem,Oregon, Iris Lovers Catalog, 1957. MARY RANDALL (Fay, 1951) M.36"
One of the most sort after irises.It is a deep rose-pink self with a brilliant tangerine red beard. This particular shade of rose, arising from the intercrossing of flamingo pink varieties, has been popularly called the "raspberry pink" of the iris patch. Very fine form. HM '51. AM'53. Dykes Medal 1955. Stevens Bros. Bastia Hill, Wanganui, 1958-59 Catalogue. Longs Garden's Summer and Fall 1958 Catalog. MARY RANDALL (Fay, R. 1950). Sdlg. T48-3. TB 36" M. R1L. Self of Bengal rose (Wilson), with red beard. New Horizon x (Fay sdlg. : Pink Cameo x Cherie)., Fay 1951. HM 1951; AM 1953; Dykes Medal 1954. Tall Bearded Historic Iris "GOLDEN MAJESTY"
Possibly one of the best heirloom irises in class for its deep, clean yellow colouration that came out of the late 1930's with W.R.Dykes (the Iris) included in the parentage. Grows well at home, increase plus and the bright yellow blooms resists fade, the form is classic, now growing among some historic blues and variegata classed Irises and its gleaming with a plus. One of the fine golden yellows, it is glistening smooth and does not fade. Of gleaming gold the good sized blooms with splendid dome form are majestic and classic looking. One of the finest iris of its color in its price class." 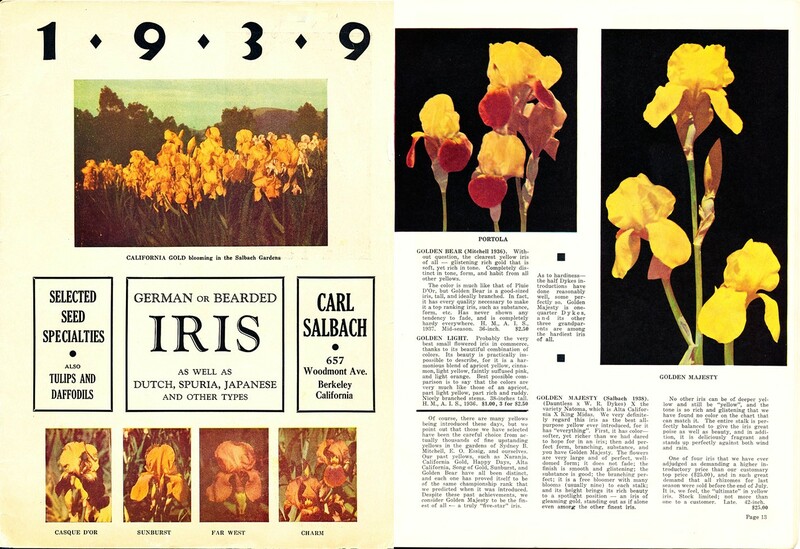 From the above 1939 Carl Salbach Berkeley, California, German or Bearded Iris Catalog. Of course there are many yellows been introduced these days, but we point out that those we have selected have been so careful choice from actually thousands of fine upstanding yellows in the garden of Sydney B Mitchell, E O Essig, and ourselves. Our past yellows such as Naranja, California Gold, Happy Days, Alta California, Song of Gold, Sunburst, and Golden Bear have all been distinct, and each one has proved itself to be of the same championship rank that we predicted when it was introduced. Despite these past achievements, we consider Golden Majesty to be the finest of all - a truly “five-star” Iris. As to hardiness the half Dykes introductions have done reasonably well, some perfectly so. Golden Majesty is one quarter Dykes and its other three grandparents are among the hardiest Iris of all. GOLDEN MAJESTY (Salbach 1938) ((DAUNTLESS x W.R. DYKES) X the variety Natoma which is Alta California X King Midas. We very definitely regard this Iris as the best all-purpose yellow ever introduced for it has “everything”. First it has color - softer, yet richer than we had dared to hope for and an Iris; then add perfect form, branching, substance, and you have Golden Majesty. The flowers are very large and of perfect, well domed form; it does not fade; the finish is smooth and glistening; the substance is good; the branching perfect; it is a free bloomer with many blooms (usually nine) to each stalk; and its height brings its rich beauty to a spotlight position - an Iris of gleaming gold, standing out as a alone even among the other finest Iris. No other Iris can be of deep yellow and still be “yellow”, and the tone is so rich and glistening that we have found no colour on the chart that can match it. The entire stalk is perfectly balanced to give the Iris great poise as well as beauty, and in addition it is deliciously fragrant and stands up perfectly against both wind and rain. GOLDEN MAJESTY Salbach, 1937 TB MLa Y4D ((DAUNTLESS x W.R. DYKES) X NATOMA). Available in the USA from, Argyle Acres, Newport Naturals. Tall Bearded Iris "QUEEN IN CALICO"
'QUEEN IN CALICO' in my opinion is Jim Gibson's queen of the pink and purple plicata's and for its specific colouration has never been superseded. It is very appropriate that it appears in the pedigree of Keith Keppels 1999 introduction 'Tangled Web'. Still used in breeding today and equally impressive is the list of Hybridisers that have used this Iris in their breeding programs.It's the pod parent of Anton Mego's very fine tall bearded iris 'Slovak Prince' that was recently featured on this blog. Gardeners who "Only Grow Modern" irises should not be put off by 'Queen in Calico's" 21 years of age. Its consistent quality bloom, a variety of high plant health, and the very best part is its reasonable price, which gives all gardener's the opportunity to grow a impressive clump. Gibson's Iris Garden, 146 South Villa Street, Porterville, California. 1980 Tall Bearded Introductions. QUEEN IN CALICO (J. Gibson, R. 1979). Sdlg. 65-4D. TB 34" (87 cm) M. Ruffled and laced light orange ground plicata, marked violet; orange beard. (Orange Plush x Anon) X (Orange Plush x 14-9A)., Gibson 1980. The Iris 'Queen in Calico' with its correct label is sold in New Zealand by Julie May at The Iris Gardens. 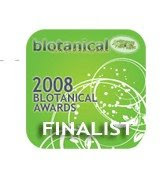 In North America its is still widely available and is listed with the following growers, Black Ridge Iris Gardens,Blue J Iris, Echo Iris Garden, Exline Iris Gardens, Hornbaker Gardens, Matthews Iris Garden, My Wild Iris Rows, Newport Naturals, Stanton Iris Gardens, Tennessee State Iris Gardens, The Iris Farm, The Iris Patch, Wanda Rezac Iris, Williamson Farm Flowers. In the United Kingdom try Seagate Irises. 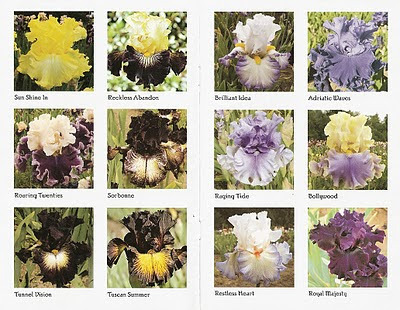 The above information thanks to Carlos Ayento of Brighton Park Iris and his incredible " MASTER HISTORIC IRIS LIST 2010"
Tall Bearded Historic Iris "MONTAGE"
NEW FOR 1972, Keith Keppel, Stockton, California. MONTAGE (Keppel) EML 34" ((Gene Wild x Majorette) x Rococo) X Mexicali sib. Brown’s Sunnyhill Gardens, Milton-Freewater, Oregon, 1974 Iris. J & J Iris Garden, Cashmere, Washington, 1975 Catalog. "And on the subject of plicata -- while I was on line, I checked out your blog site more extensively than before. Was amazed to see Montage...the fact that it even exists, let alone in New Zealand! Montage was one of the key elements in developing my bicolor plicata lines, way back when...but it was never, itself, a success. It had growth problems, for in California's long growing season, virtually all the increase would bloom without replenishing. I gave up trying to list it after a year or so, as in the field rows where it was pampered it would tend to bloom to death. Only after I gave up, but stuck a sprig in the mixed herbaceous border, did I ever get it to grow as I'd hoped. Being half-smothered by chrysanthemums and such, it did not grow so well...so did not initiate bloom buds so readily and actually increased!" MONTAGE (Keith Keppel, R. 1970). Sdlg. 65-6F. TB 34" (86 cm) E-L. S. buff yellow (near M&P 10-F-1) blended light lavender (42-B-4) on midrib; F. white with wide almost solid plicata border of greyed lavender (44-E-5) with rosy plum haft; white beard tipped bronze-yellow. ((Gene Wild x Majorette) x Rococo) X sib to Mexicali., Keppel 1972. 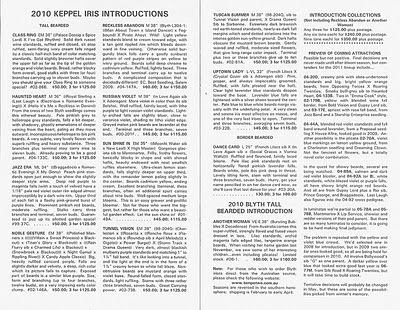 Two weeks ago Keith Keppel's Iris Catalogue arrived in the post. Each catalogue received becomes part of the truly amazing continuum from one of the hybridising Giant's of the Iris world. It's just to bad Importing Irises to New Zealand is a wee bit tough at the present time, but things could change!! 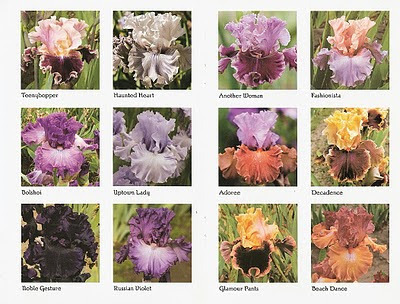 Anyway for those visitors to the blog lucky enough to live in the USA go and buy yourselves some classy Irises and for the rest of us we will just have to enjoy the pic's, and dream of what could of been. "Hold fast to dreams for if dreams die Life is a broken winged bird that cannot fly. Hold fast to dreams for if dreams go Life is a barren field frozen in snow."